Jumping up is a common behavior problem among dogs. You may be annoyed by your excited, overly exuberant dog attacking you the minute you step through the front door. But it can actually be dangerous for small children, people who have physical disabilities, some older people, and people who aren't expecting your dog's greeting. The good news is that you can train your dog to stop jumping on people and start greeting everyone more politely. 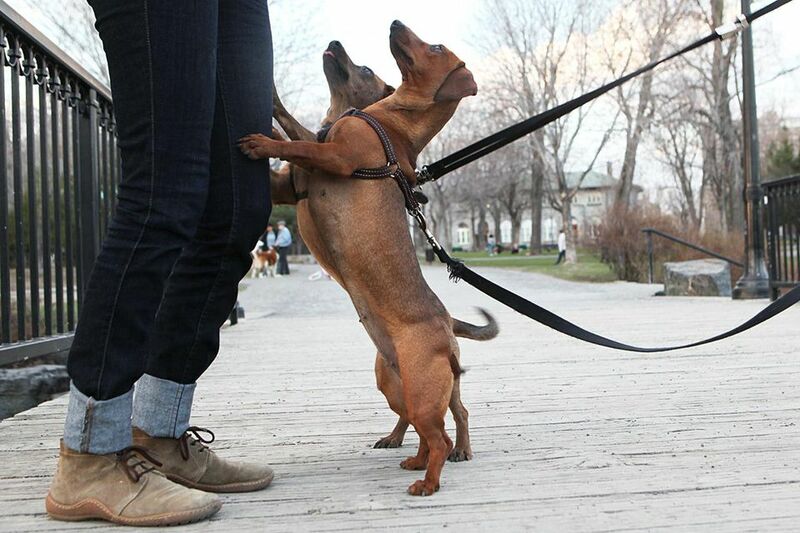 There are a number of theories about why dogs jump up on people; popular among these are dominance and greeting behaviors. The truth is, though, that your dog is probably jumping up to say, "Look at me!" You might inadvertently be rewarding your dog for jumping up on you by giving it what it wants. As is often true of kids, negative attention may be better than no attention. Your dog doesn't necessarily realize that when you push it off or yell at it to get down that you're attempting to punish it. Instead, your pup may view your behavior as exactly what it's seeking: treasured attention from you. In this case, any type of attention that the dog gets from you or others may be perceived as a reward. It makes sense then that instead of rewarding your dog for jumping up, you make it more rewarding for it to keep all four paws on the floor. Training your dog not to jump up on people takes patience and persistence on your part. Be aware that there are actions that you should take and others that you should avoid. Be consistent when you're training your dog, and you'll be rewarded with a best friend who keeps its front paws to itself. As soon as your dog jumps up, turn your back. Cross your arms over your chest and don't make a sound. If the dog runs around to jump up again, turn the other way. Wait for the dog to stop jumping. Another method is to remove yourself altogether. If your dog jumps up when you walk in the door, turn around and walk back outside. If it jumps up when you're inside, walk out of the room. Wait a moment; then step back inside. Repeat this until your dog calms down. When you're working on preventing unwanted jumping, it can really help to keep some treats close at hand. As soon as your dog is standing in front of you with all four paws on the ground, toss it a treat. Praise your dog as well, but keep things low key. Too much excitement and attention from you may stimulate another round of jumping. It helps if you can set up situations to practice with your dog. For instance, if the jumping occurs most often when you come home after work, spend a few minutes several times a day coming and going. Don't make a big fuss over your dog and step back outside if it jumps up. Offer a reward anytime all four feet are simultaneously on the floor. Once your dog is able to keep four paws on the floor for a few seconds or more, start asking it to sit. Walk into a room or through the front door and give the command "sit." As soon as the dog sits, offer a treat. Practice this over several training sessions. With plenty of repetitions, your dog will start sitting as soon as you walk through the door or enter the room. It's not enough that you practice with your dog. You should also involve friends and family in this training. Otherwise, your dog may learn that it's not OK to jump up on you but everyone else is fair game. Having other people help with this training teaches your dog to keep all four paws down no matter who comes into the room. If you knee or leash correct your dog too harshly or improperly, you can seriously injure the dog. When you use a knee to the chest, you may knock your dog down, but the dog may interpret this as your way of initiating play. Your dog's response will likely be to jump up again to continue the game because you've actually reinforced the behavior you're trying to stop. Your dog may learn not to jump up only when it's on ​a leash. Since most dogs aren't leashed 24/7, chances are your dog will have plenty of opportunities to get away with jumping up when it's off its leash.